This 100-year-old adobe has recently been restored to its original Santa Fe style with hand plastered walls, hand-hewn vigas, original nicho, and Saltillo tile. This one room studio reflects modern upgrades including radiant heat, new kitchen and appliances, and bathroom. Tastefully furnished with antiques and collectibles with one queen bed and shower bath. The wonderful, sunny and bright courtyard allows for al fresco dining. 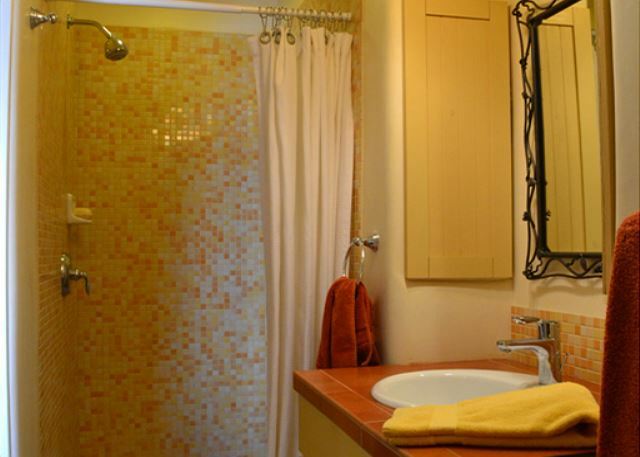 Located next to Casa Cubero, a one bedroom, one bath vacation rental if you have additional guests. Walk out your door and you are within a few walking blocks to the Railyard District, which hosts the Farmers Market, festivals, restaurants, shopping, and art galleries. As well, it is within walking distance to the Historic Plaza and the Canyon Road Historic Arts District. Cable television and wireless internet. Approximately 400 square feet. Very good location with attention from the manager. The problem with the flow of warm water in the shower is hopefully addressed as promised. I really enjoyed my stay here. Perfect location, perfectly equipped studio. Terrific little Casita in the Rail Yard district. 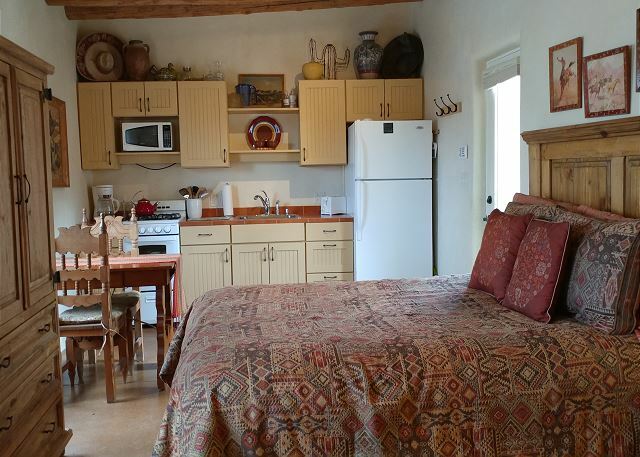 This Casita will give you access to all things Santa Fe by only a short walk. I highly recommend this Casita. The rental is adorable and decorated in a southwestern style, and also has a pretty little patio where you can eat outside. The location is conveniently located just blocks from the Plaza. It was delightful! Definitely stay again! Team are super professional. Great location to walk to things. Nice outdoor space. The only draw backs were no A/C and windows facing the parking lot.